Reckleford House was a Georgian House built between 1806 and 1831 - it doesn't appear on Watts' map of 1806 but is present on his 1831 map. It stood on Reckleford Hill (today's Reckleford) facing Rackleford (today's Market Street) and the area was known as Reckleford Cross because in earlier times a wayside cross had stood there. 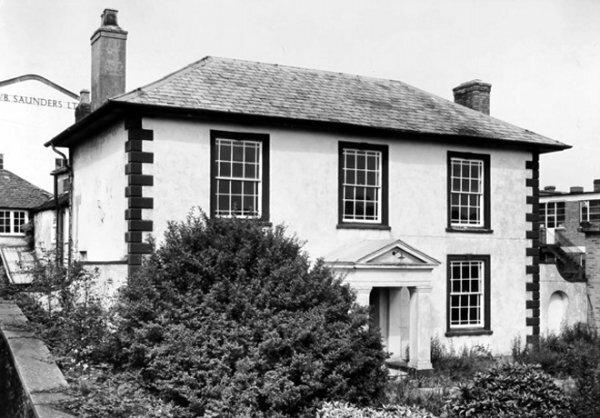 Reckleford House was an impressive two-storey, three-bay stucco house with stone quoins and window surrounds and wide overhanging eaves under a Welsh slate roof. 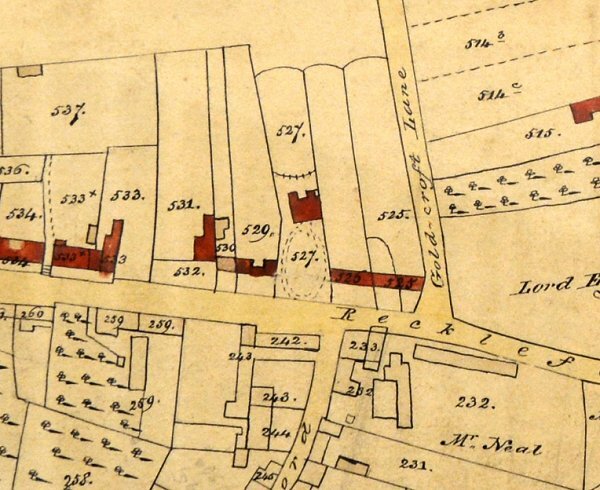 In the 1842 Tithe Map Reckleford House was shown as Parcel 543 with an area of 0a 2r 0p and the 1846 Tithe Apportionment noted that the owner was William Whitby and the tenant was glove manufacturer Thomas Dampier. 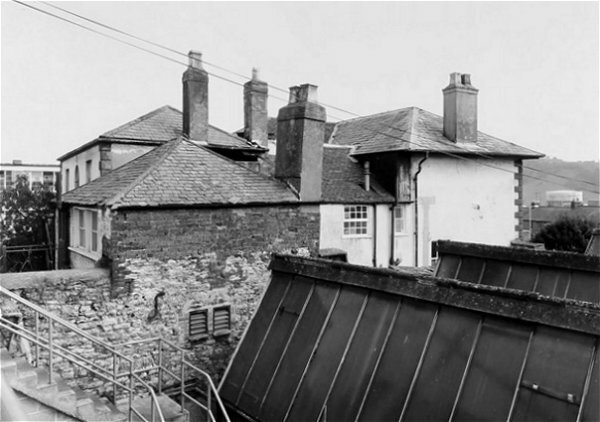 Wealthy glove manufacturer Richard Ewens lived at South Street House with his wife Mary. She, however, died in 1870 and after her death Richard moved to Reckleford House where he was listed in the 1871 census. The 1881 census recorded Richard and his new wife Sophia living at Reckleford House with a live-in nurse and two domestic servants. Richard was by now aged 65 and listed his occupation as a glove manufacturer. The fact that a nurse was in residence is an indication of how poor Richard's health was and, indeed, he died on 22 April, just a couple of weeks after the census was taken. Sophia continued to live in Reckleford House until at least 1919. In Kelly's Directory of 1935 Reckleford House was listed as the offices of the Western Electricity Supply Co (see Gallery below) but by the time of its demolition in the mid-1970s for the widening of Reckleford it was the offices of the Ministry of National Insurance. E Watts' map of 1831 shows today's Reckleford running across the centre of the map and Rackleford (today's Market Street) running down from centre to bottom centre. The house coloured red at upper centre in the Parcel marked 527 (not quite opposite today's Market Street as it should be) is the recently-built Reckleford House. 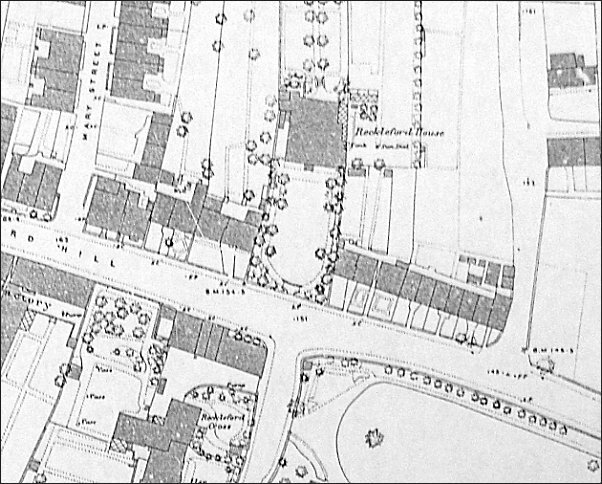 The 1886 Ordnance Survey showing Reckleford House at centre. 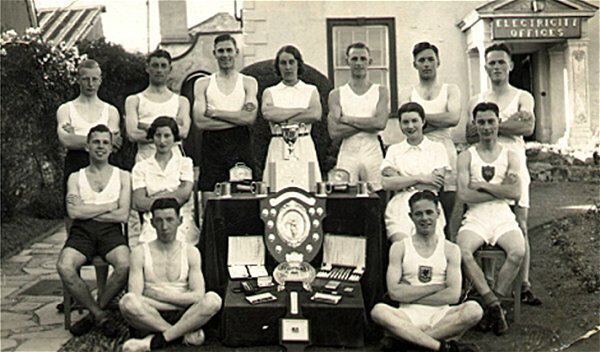 Reckleford House was the offices of the Western Electricity Supply Co. so presumably these were staff of the company, posing with their sporting trophies outside Reckleford House in the mid-1930s. Many thanks to David, whose great-uncle Harold Collard (b1913) is standing in the back row at far right. Can you name anyone else? 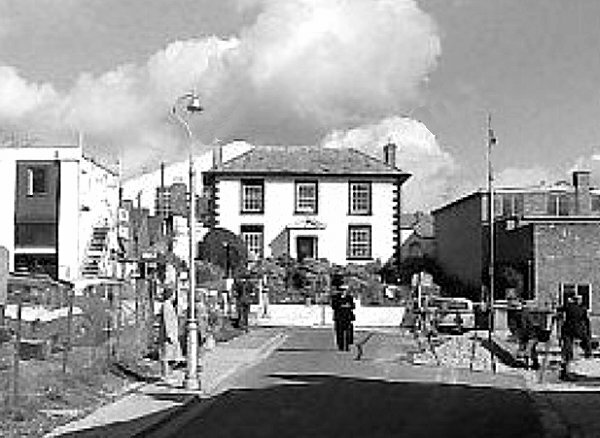 The area known as Reckleford Cross photographed in the 1960s from Market Street looking towards Reckleford. Palmer's fish restaurant is on the right and directly ahead Market Street joins Reckleford with Reckleford House at centre. To see the same view today click here. An enlargement of the previous photograph to give a better view of Reckleford House. The grand vista of Reckleford (seen from outside Palmer's fish & chip shop) with Reckleford House just right of centre. Photographed in 1972. Facing Reckleford, the south elevation of Reckleford House, the former home of glove manufacturer Thomas Dampier. Photographed in 1972. 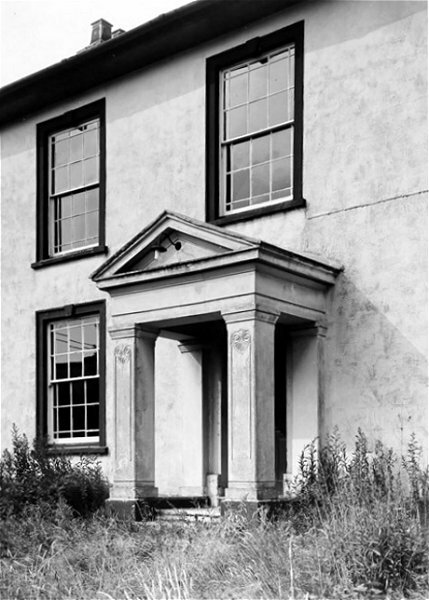 The somewhat austere porch of Reckleford House, photographed in 1972. 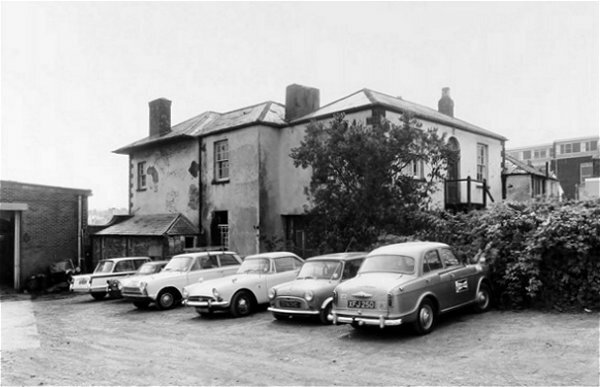 The east elevation of Reckleford House, photographed in 1972. The west elevation of Reckleford House, photographed in 1972. 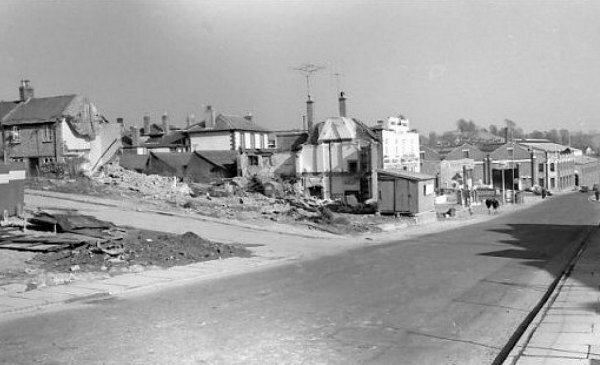 The demolition of much of Reckleford for widening in the mid-1970s. 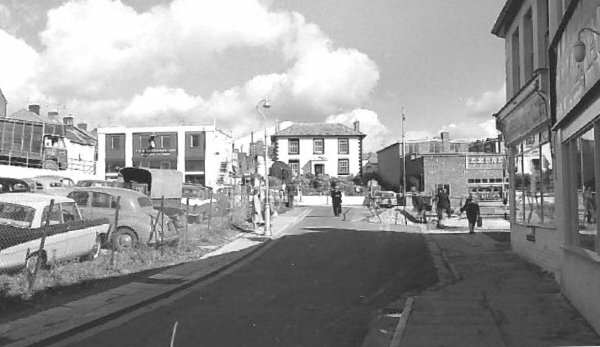 At left the houses in Mary Street have gone and FWB Saunders' garage is about to be demolished. 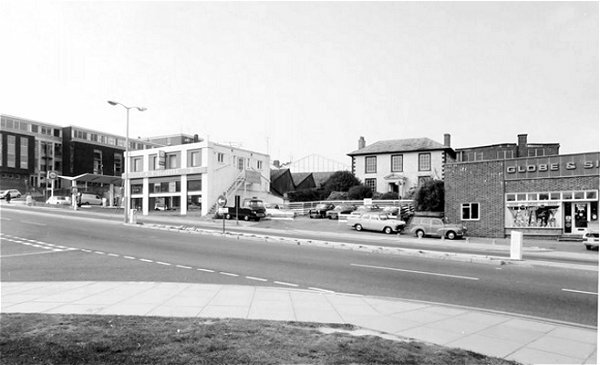 Just left of centre, and seen almost from the side, is Reckleford House which was at this time the offices of the Ministry of National Insurance. It too was demolished shortly after this photograph was taken.